After a long cold winter, there is nothing more exciting than visiting your local market. The sight of fresh spring produce bursting off the shelves! You know that fruits and vegetables are an important part of your daily diet and have many health benefits. But how can you best balance the micronutrients and minerals from Mother Nature while sticking to your kidney diet limits? Which fruits and veggies are low potassium choices? Fruits and vegetables are a natural source of vitamins A and C, folic acid, fiber, antioxidants and potassium. One of the most important minerals, potassium, has many functions in the body. It helps control nerve and muscle functions. It helps the heart contract,. Plus it is necessary for the kidneys to maintain fluid and electrolyte balance. The kidneys have a very important job in maintaining potassium at a normal level- between 3.5 and 5.5 mEq/L. As kidney function decreases, its ability to balance potassium effectively also decreases. Potassium may build up in the bloodstream with dangerous consequences. Hyperkalemia is the medical term for excess potassium in the blood. It can cause numbness, weakness, nausea and slow the heartbeat. It can even be fatal. It is important to limit healthy produce high in potassium to help prevent your levels from getting too high. You want to find the right fruits and vegetables naturally low in potassium to help maintain a normal potassium level. Luckily, nature has provided many options. For those on a low potassium diet the recommended portion size for fruits and vegetables low in potassium is ½ cup. Most patients on a low potassium diet can eat at least 5 servings of low potassium fruits and vegetables a day. Your number of servings may vary. It is usually determined by your dietitian based on your potassium lab values and food preferences. 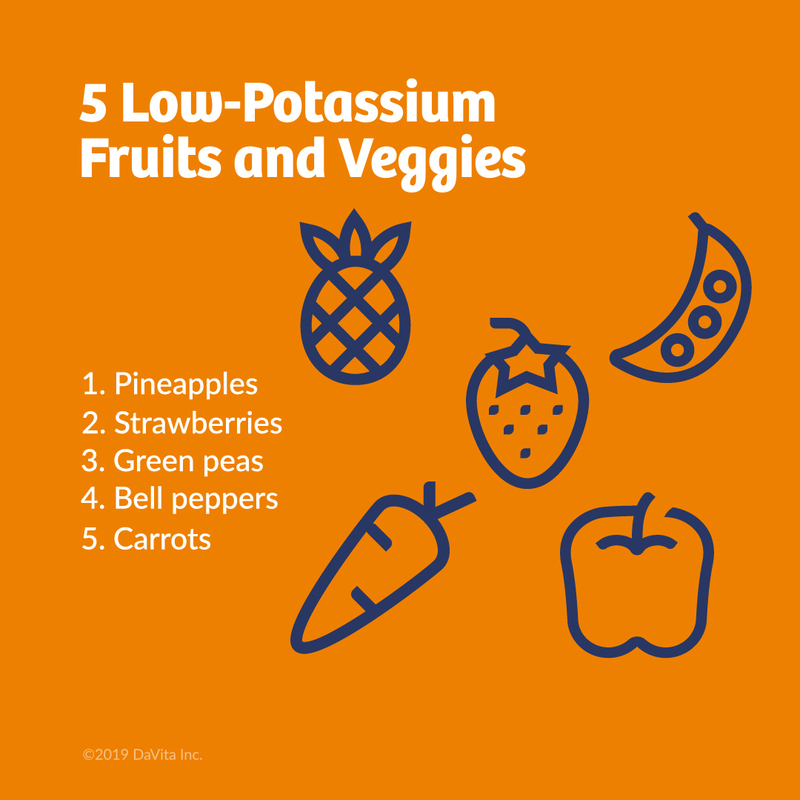 Below, you can find a chart of low-potassium fruits and vegetables with their respective amounts of potassium per serving. You can use this chart as a guide when going grocery shopping or at your local farmers market. Disclaimer: The above lists is a sample of foods low in potassium and doesn’t include all foods low in potassium. Consult your dietitian and doctor about what to eat based on your individual requirements. Here are some recipes with the most popular vegetables in season! You can find many recipes on DaVita.com created by DaVita dietitians. If you have specific produce you would like to cook, you can search the website by including your ingredient in the search bar. For more recipes download our Cookbooks or visit our website www.davita.com. 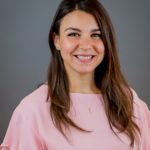 Katerina is a registered dietitian nutritionist based out of New Jersey. Her passion is helping people rediscover the joy of healthy eating and making the complicated science of nutrition accessible to everyone. When she is not working with in an outpatient dialysis clinic, she practices Intuitive Eating -helping people make peace with their bodies, while cultivating a healthy relationship with food. In her free time Katerina loves spending time with her family and playing with her dogs. Charts like this are so helpful when food shopping wish there were more with different breads,coffee creamers,drinks,milks,meats would be so helpful in the supermarket when planning meals Thank You Love DeVita !! !